Today I had to go to Oak Woods Cemetery to get a photograph of Big Jim Colosimo’s grave – and to see for myself if the rumors that it had been broken into were true. Well, it’s easy enough to imagine – everyone’s heard about gangsters from the 1920s getting lavish funerals and million dollar coffins. Colosimo, a relatively early vice lord who ran a fancy cafe and was a noted patron of the opera, was shot and killed in his cafe in May of 1920 (by none other than Al Capone, according to legend), clearing the way for the gangs to move into the liquor rackets. It wasn’t until a few years later that massive gangland funerals became the order of the day, but Colosimo WAS buried in style, and, well, can we expect that would-be grave robbers would have really looked up all the details? I can’t imagine how they thought they’d get the coffin out of the tomb, let alone carry it back to their car or drive away with it, but, hey, it’s none of my business. Here’s how the tomb looks today (not pictured are the mournfully-cawing crows who circulated about while I took the pictures). Unlike, say, the Couch vault, we can see inside, which gives us this curios view. Notice anything odd about the dates in this photo by Natalia Wood? The date there says 1919. 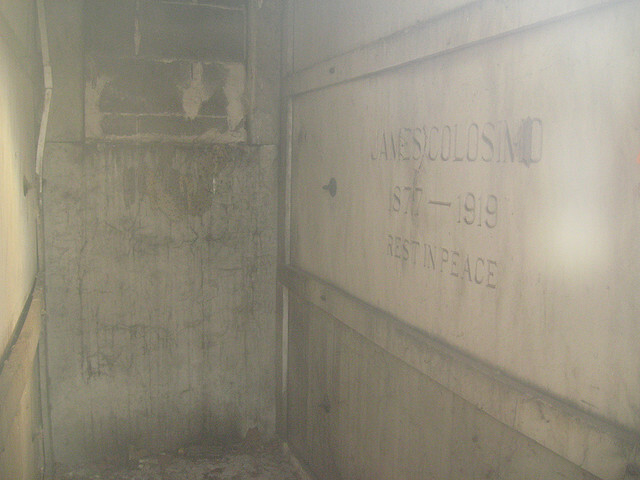 Colosimo died in May, 1920. The death certificate confirms his age and place of interment, so this is kind of a mystery. Do we have the wrong man here? Did whoever carved it just screw up and figure no one would ever see it, so it didn’t really matter?